After the Google AdWords Interview I did with Lynn Terry a couple of days ago, the tracking issue came up. So, I decided to ask Matt Levenhagen, my AdWords mentor to explain how AdWords tracking really works. •	1. What is the difference between campaign, ad group, text and keyword tracking? •	2. Are they all necessary? •	3. How does tracking help you make more money? •	4. Any tools you recommend to make it easier to track? And, of course, Matt didn’t disappoint: his answers are very thorough, and give great information. He actually wrote an entire report, an I decided to split it into multiple posts here, as to give you the opportunity to digest it in small, bite-sized chunks and ask any questions you may have. 1. What is the difference between campaign, ad group, text and keyword tracking? It depends on what you control on each level as to what you track on those levels. And there are different tools or sources you’ll use to determine how you collect and act on that data. Those 3 things for example are controlled only on a campaign level. If you want differences, you need to split up your campaign into multiple ones. For example, if you determine you want to target multiple countries in different ways, you’ll need to create more campaigns. Some of this information is simply gathered from your Affiliate Program and/or Network reports. You sometimes are given the information as to where the purchase came from, when they bought the items etc… And you can take those trends and change your geo targeting or ad scheduling to improve your profit situation. There are also 3rd party scripts that help you collect that data. I have scripts that collect where conversions have come from; so even though I don’t get that in that affiliate programs reports, I can collect that data myself by intercepting that traffic before it gets to the merchant’s site. I can also determine if I’m just getting the sales from Google or their search partner. I can’t tell you how many times I’ve determined that search partners didn’t convert at all, but was where most of my spend was coming from. These are definitely things that can save you a lot in terms of costs and increase profits. There you have it: Campaign Level Tracking! Thank you Matt: excellent info about campaign level tracking. I especially want to thank you for the tip about Google search partners: we definitely wouldn’t want to leave a huge leak in our campaigns. You can learn more from Matt at his Campaign Blasts Forum, where he teaches everything you need to start building an incredible, Profit Pulling Affiliate Marketing Business. He not only answers questions there every day, but shows his members how to go from keyword research to campaign expansion, and even holds campaign blasting challenges, which is how I found my PPC success. Next, look for Ad Group Level Tracking. It’s time for another free niche research, and I had a hard time choosing which one to do: I have so many niches I’d like to share with you! Today’s niche is Foam Insulation. There aren’t a lot of easily accessible resources about foam insulation, which makes it all the better if you put just a little effort into it. go to the library and borrow some books, or just buy a couple from Amazon.com . Or, you can find some construction contractors to interview. Amazon.com has many foam insulation products, as well as instruction books, equipments, etc. This niche has some pretty high AdSense payouts, so you could create a general information site, where you include all types of foam insulation. Add some videos for those who,like to see what they learn, and you have the makings of a great niche site. You can also create mini niche sites revolving around the long tail key phrases that abound in this niche. Questions? Suggestions? I’m all ears. Good luck if you decide to gt into this niche: it’s ripe for the taking. Please spread the word about Free Niche Friday Research. Thank you. Ultimate Guide to Google AdWords: How to Access 100 Million People in 10 Minutes (Ultimate Series) Have you lost money trying to make money with AdWords? I did! And not just a little money, but a lot of money. I’ve probably made every mistake in the book, but I eventually figured it out and recouped what I lost and made a lot more in the process. As you probably know, there are a number of different pay per click networks out there. But the most well known is Google’s Adwords: simply because the amount of traffic Google gets pretty much guarantees your ability to make money with Adwords. It’s not quite as easy as just sticking up an ad and watching the money roll in: you have to carefully select what you’ll be promoting. Along with making sure the page you’re sending traffic too has a decent quality score and you’re not blowing your budget. What Should You Sell to Make Money With Adwords? When deciding what to promote many find it easy to just select products with a high payout, thinking that you need less sales to make a good income. But, many times you can get a larger volume of sales for lower priced products, making it possible to be wildly profitable. So price shouldn’t be your only consideration: you should also take into account what the products sales page looks like, how popular an item is, how many others are promoting it, etc. In a hurry? 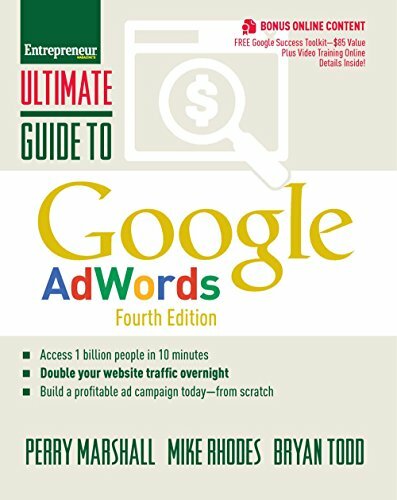 Check out these Adwords books: you can learn all you need to know in no time! The first thing you want to do is decide if the sales page is any good. Does the copy make you want o buy, does it trigger any emotions in you? Is it nicely formatted? Next you want to check for any leaks which are any links that when clicked you won’t get paid. So things like AdSense, links to other sites, affiliate links for other products, etc. Google uses a system called a quality score and if you want to make money with Adwords then you need to pay close attention to this. As a high quality score means a lower cost per click and that your ad will show up in a higher position. Of course if you’re sending traffic directly to the merchant then you have very little control over the quality score. To ensure a high quality score you want to make sure your keywords are as targeted as possible and if the page your sending traffic to isn’t that good then create your own landing page. Make Money With Adwords Instead of Overspending! One of the dangers you’ll face when trying to make money with Google AdWords is overspending. As Google is the biggest search engine and thus gets the most traffic, you can go to bed, wake up the next morning and find thousands of clicks on your ad. Which isn’t a bad thing if your ad is targeted and you’re making sales, but when your campaign is new and you’re still testing it you can easily end up spending a few hundred dollars while only making ten or twenty. So you want to set yourself a budget to avoid this. Start with whatever you’re comfortable losing, and as you find your profitable keywords, you can increase your budget, while cutting your unprofitable keywords. One of the biggest mistakes people make when starting to use AdWords to make money is just throwing a campaign out there, and hoping to make money. Sometimes, they do make some money, but never know which keyword or key phrase made them that sale. And so, they continue to pay for keywords that are losers, instead of concentrating on the profitable ones. Still need help? These Adwords books are full of actionable tips! 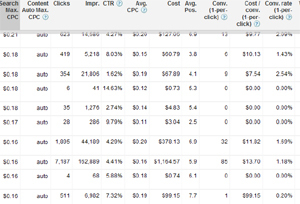 There are any number of people who make money with Adwords but there are also many people who lose money with Adwords. If you want to be a member of the first group then you need to carefully select which products you promote. Making sure not just to go for products with high commissions and checking the sales page has no leaks, Along with keeping your quality score as high as possible. Even if that means going to the effort of creating your own landing page. Lastly especially when testing new ads you’ll want to keep an eye on the budget. As I mentioned in one of my previous posts, I have lots of PLR articles on my hard drive, and I decided to use them this month and see what kind of results I can get. You can follow me here. Since it’s already the 9th, I’ll have to create 2 lenses a day for at least half of the month, but that’s no problem: with everything already on my hard drive, it shouldn’t take me more than 30 minutes each. I am not going to create huge lenses, as I am following the Info Product Killer Method: they will be specific to a product, almost laser focused, so it should be quick and painless. I’ll add the lenses here as I complete them, and then come back in the beginning of December and follow up with how it worked out for me financially. Anyone else out there interested in doing this challenge with me? Let me know below if you are interested, and we can keep each other accountable.